The Kazan Cathedral in St. Petersburg. The Cathedral of Our Lady of Kazan is one of the best-known symbols of St. Petersburg. Inspired by St. Peter's Basilica in Rome, it was built in 1811. RBTH remembers some interesting moments in the history of one of the northern capital's most important ornaments. Tsar Paul I thought of building the Kazan Cathedral on the spot where the old Church of the Nativity of the Holy Virgin had stood. He held a competition, in which architects from across Europe participated, including Pietro Gonzago from Italy, Charles Cameron from England and Jean-Francois Thomas de Thomon from France. The emperor had already approved Cameron's design when Count Stroganov recommended a young Russian architect by the name of Andrei Voronikhin, who had not submitted an entry in the competition. Tsar Paul liked the design, and Voronikhin was appointed chief architect. Tsar Paul wanted the new edifice to resemble the St. Peter's Basilica in Rome. Voronikhin designed an enormous colonnade, which alluded to the Italian cathedral. 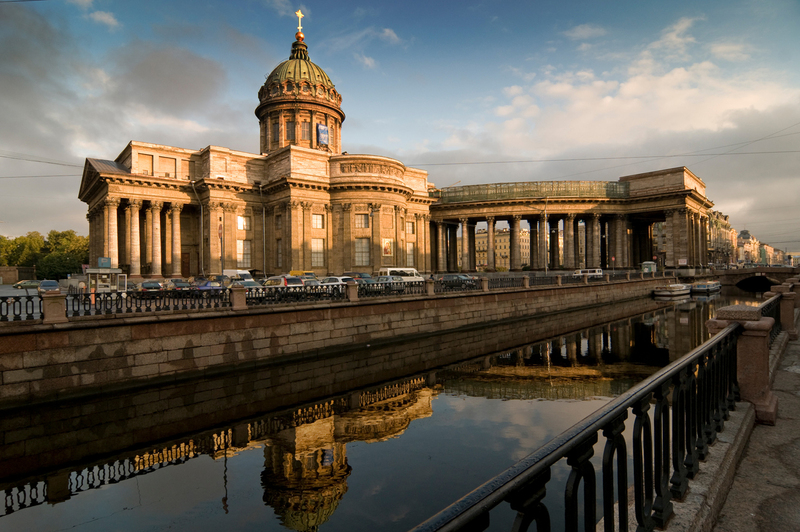 The Kazan Cathedral's 96 columns were not placed along the perimeter; rather, they opened towards Nevsky Prospect. The cathedral's northern side became the ceremonial entrance. According to Voronikhin's original design, another colonnade was supposed to be erected on the southern side, but the idea was later abandoned. The northern doors were cast in bronze and modeled after the Florence Baptistery's Gates of Paradise, crafted by Lorenzo Ghiberti. Voronikhin's contemporaries called him a "imitator" for copying the Italian masterpieces. The cathedral is like a museum of Russian natural stone. The main decorative material is travertine, which was quarried not far from St. Petersburg. The stone is similar to the Italian travertine used to build St. Peter's. Travertine, with its porous structure, can be handled easily, and was used for covering the cathedral's external walls, for the capitals, the friezes and the casings. Inside the church, Voronikhin used Karelian marble, local porphyry and jasper. 56 pink granite columns with gilded capitals decorate the interior. Both the interior and external façade of the Kazan Cathedral are adorned with sculptures and bas-reliefs. Bronze statues of the saints were sculpted by Stepan Pimenov, Ivan Martos and Vasily Demut-Malinovsky. The walls are decorated with paintings created by famous artists, such as Karl Bryullov and Vladimir Borovikovsky. The cathedral was completed a year before the French invasion of 1812. Before leaving to join the army, commander-in-chief Mikhail Kutuzov visited a mass held in the church. After the war, trophies were brought to the cathedral, such as military banners and standards, keys from seized cities and the baton belonging to Marshal Louis-Nicolas Davout. Kutuzov himself was interred in the cathedral after his death in 1813. The Church of the Nativity of the Holy Virgin had been the court church of the House of Romanov. It contained a copy of the Our Lady of Kazan icon, which was the most important icon in the Russian Orthodox Church, for it protected Russia and consequently the Romanov dynasty. When the Kazan Cathedral was built, it inherited both the icon and the role of the court church. Royal family weddings, thanksgiving prayers after the unsuccessful assassination attempts on Alexander II, and the 300th anniversary of the Romanovs were all held in the cathedral. The cathedral was dedicated to the Our Lady of Kazan icon, one of the most venerated Orthodox relics. It contains a copy of the icon, which is considered to work miracles. It is believed that Peter the Great ordered the relic to be brought to St. Petersburg, and before the construction of the Church of the Nativity of the Holy Virgin, the icon was housed on the Petrograd side of the city. In the 19th century, a Sunday school for adults was held in the cathedral. The church also published its own newspaper and was a famous charity institution. During WWI, parishioners collected food and warm clothing to be shipped to the front. The cathedral also served as one of the first Russian field hospitals, which was founded with funds donated by the congregation. Empress Alexandra Fyodorovna was its patron. In 1929, the Bolsheviks closed the cathedral and three years later gave the building to the Academy of Sciences. On the dome, a gilded globe and spire replaced the cross. All the church items were distributed among the city's museums, and the Museum of the History of Religion and Atheism was established inside the cathedral. Its exhibits illustrated the appearance and evolution of Christianity, Islam and Eastern religions. Saints' relics that had originally lain inside the cathedral were kept in the attic for almost 20 years. Staff of the Museum of the History of Religion and Atheism had moved the relics of Saint Alexander Nevsky, Saint Zosima and others to the attic. Only in 1991 were they returned to their original places. Nevsky's relics were transferred to the Saint Alexander Nevsky Monastery.